Over the years ComplianceOnline has conducted many trainings for multiple industries which are valuable resources for various departments/titles of a company. Based on user feedback we have combined trainings which can be valuable to a particular title or industry and providing as a packaged courses having multiple modules. These trainings are available as CDs so that it can be used to train whole department at lesser cost than purchasing individually. This Water system compliance training will give you a comprehensive knowledge about water system compliance with relation to Microbial Quality Problems, Microbial Testing, Endotoxin control, Sanitization, Water system validation. 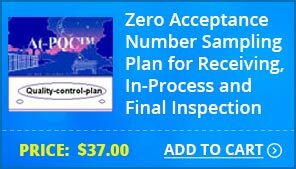 This System Based Inspections training will give you a comprehensive overview of all aspects of systems based inspections covering Quality, Facilities and Equipment, Materials, Production, Packaging and Labeling and Laboratory Control. 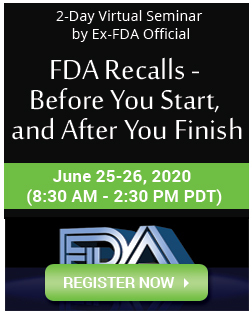 This comprehensive FDA inspection training package consists of five training webinar recordings covering everything from preparing for FDA inspections to responding to FDA Form 483s and warning letters. 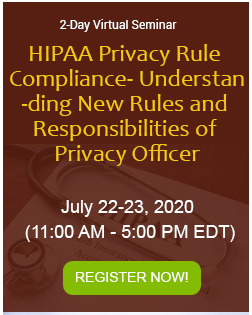 A training package comprising three best-selling webinars that covers all aspects of the Physician Payment Sunshine Act, including the final rule, reporting and tracking requirements, how sponsors and investigators of clinical trials can comply and acceptable and unacceptable practices. Validation and use of Microsoft Excel Spreadsheets, Good documentation practices, Using Styles in Microsoft Word, Reducing the cost of creating documents. The main purpose of stability program is to evaluate a shelf life for a product to enter a market and before that determine a safe stability profile during clinical trial. There are many guidance which showcase the best practices how to achieve a successful stability program and then specific guidelines are formulated for a particular product ex - ICH regulatory guidance, QBD, PQS, QRM. This Pharma GMP courseware covers all aspects of good manufacturing practices starting from difference between GLP and GMP, vendor selection, supplier agreements & management, raw material risk management, , ,HVAC, GMP environmental control, pharma compressed air, annual product reviews ,deviation investigations, human error reduction strategies. This package of 5 training courses is meant to give an exhaustive and in-depth understanding of the Japanese Pharmaceutical Affairs Law (PAL) including the 2005 revisions which are now in force. The following is a pack of 4 best-selling training CDs for sales, marketing & regulatory professionals in the Pharmaceutical industry. These courses provide solutions for all critical challenges & questions faced by you and your team pertaining to regulations/compliance, best practices, etc. This comprehensive training package of 8 courses is aimed at helping pharma/drug companies avoid the most cited regulatory pitfalls and ensure their compliance initiatives for 2013 are on the right track. This comprehensive training program will discuss CDISC requirements to create SDTMs and ADaMs. It will also offer essential mapping and strategy concepts for creating and validating SDTM and ADaM variables in key CDISC datasets (DM, AE, ADSL, and ADAE). ComplianceOnline has created these courses individually through world renowned experts and combined them together to create a comprehensive training resource for companies to train their employees. You can store it as a library material and train all your employees in these compliance issues to get them ready to face any kind of compliance challenge and overcome it through expert advice and best practices. 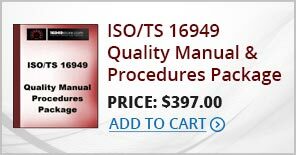 This pack of 5 best-selling training CDs for regulatory professionals provides information on how medical device companies can achieve compliance with the EU Medical Device Directive, obtain CE marking and fulfill ISO requirements. The following is a pack of 5 best-selling training CDs for regulatory professionals in the Medical Device industry. These courses provide information on how medical device companies can achieve compliance in the important stages of device development, marketing and maintenance. This Medical Device Software Development & Management package training will have 4 courses which covers FDA's Medical Device Software Regulation, Medical Device Software Verification and Validation, IQ / OQ / PQ Approach and IEC 62304. This comprehensive training package is aimed at helping medical device companies ensure that their supply chain controls and manufacturing processes comply with existing regulations. This pack of 4 courses contains some of our best selling Medical Device webinars which together cover the essential compliance challenges faced by Medical Device companies today. 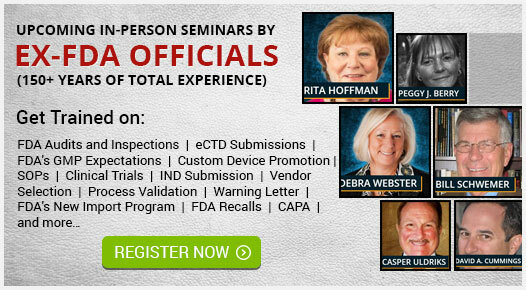 This pack of 2 courses contains the essentials of FDA Medical Device regulations. The following is a pack of 4 best-selling training CDs for sales, marketing & regulatory professionals in the Medical Device industry. 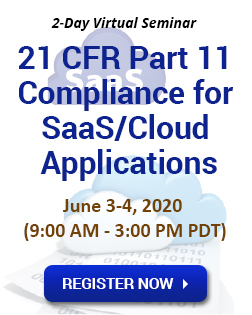 These courses provide solutions for all critical challenges & questions faced by you and your team pertaining to regulations/compliance, best practices, etc. The following is a pack of 3 best-selling training CDs for regulatory professionals in the Medical Device industry. These courses provide information on how medical device companies can achieve compliance with the EU Medical Device Directive, obtain CE marking and fulfill ISO requirements. The following is a pack of 8 best-selling training CDs for regulatory professionals in the Medical Device industry. These courses provide information on how medical device companies can achieve compliance in the important stages of device development, marketing and maintenance. 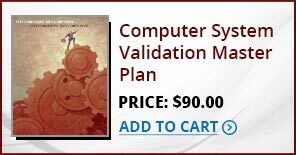 This medical device software development, verification and validation training package of four courses covers wellIEC 62304 requirements and explains risk based approach for validation using validation protocols and GAMP®. This comprehensive training package of ten courses is aimed at helping medical device companies gain a thorough understanding of the top 10 regulations that they should comply with. This comprehensive training package of 8 courses is aimed at helping medical device companies ensure that their supply chain controls and manufacturing processes comply with existing regulations. Clinical Labs are a tough environment to be in. Not only are there a multitude of rules, there are a number of areas which are not very clearly defined. On top of all this, the rules keep changing all the time. 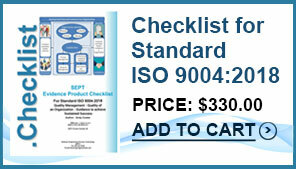 The following training is a pack of 10 best-selling training CDs for the microbiology lab. 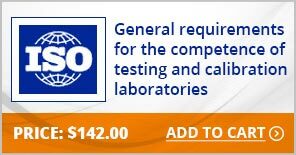 These courses provide solutions for all critical challenges faced by microbiology lab professionals pertaining to regulations/compliance, best practices, quality, etc. 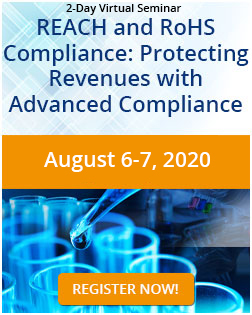 This comprehensive training package of six courses is aimed at helping laboratories get a head start on their compliance programs for 2013, with renowned regulatory expert Dr. Ludwig Huber as the guide. This JAPAN Regulatory compliance training is designed to provide an overview of the regulatory environment in Japan with respect to regulatory filings and registrations. 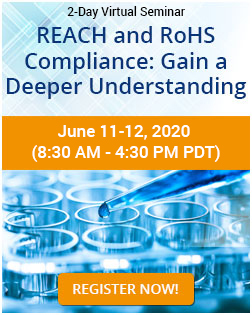 This Latin America Regulatory compliance requirement training/webinar will cover topics relating to pre-clinical and clinical requirements, as well as, addressing the structure of the regulatory agencies in Latin America. This comprehensive training package of three courses is aimed at helping clinical laboratories ensure compliance with CLIA requirements. This comprehensive training package of four courses covers clinical trial monitoring techniques, audit procedures and the setting-up of Data Monitoring Committees (DMCs). 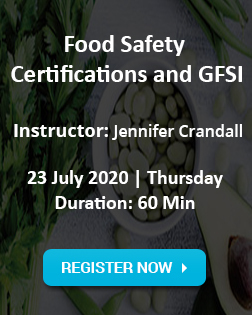 Learn the nuances of food safety and labelling requirements such as Sanitary Control of Product and Services, application of NOM-051-SCFI/SSA1-2010, basic requirements of the Canadian Food label, requirements for the location and size of the common name, net quantity declaration, list of ingredients and allergen labeling, identity and principal place of business, date markings, nutritional labeling, bilingual requirements, irradiation, and sweeteners. Guidance offered in this course will comply with regulations set forth by the Food and Drugs Act (FDA), Food and Drugs Regulations (FDR), Consumer Packaging and Labelling Act (CPLA), Consumer Packaging and Labeling Regulations (CPLR), United States Department of Agriculture (USDA) , Mexican food regulations and other relevant regulations. This food preservation and packaging comprehensive training package of five courses is aimed at food manufacturers and covers US and EU regulations related to alternative food preservation techniques and food contact packaging. This comprehensive training package of five courses covers the control of foreign material and pathogens in food manufacturing as well as food recall handling techniques/management. The following training is a pack of most informative and top selling training CDs on topics related food safety compliance in 2012. These courses provide details on how to implement the best practices for food safety for your unit/organization/product pertaining to regulations/compliance, best practices etc. The following training is a pack of most informative training CDs on topics related food safety pursuant to FDA regulations. These courses provide details on how to implement the best practices for food safety under FDA rules and regulation pertaining to compliance etc. A comprehensive expert-led intensive training course on all aspects of using International Financial Reporting Standards (IFRS), GAAP, Internal Control, Accounts Payable Fraud and Social Media for Finance (FINRA). You will be able to render decisions about these scenarios which is just one of the many goals of this Finance Training Course. This suite of finance training covers four courses - IFRS effect on SOX Control, IFRS vs GAAP and its adoption, FCPA, P2P Metrics and Travel Claim Fraud. The following training is a pack of most informative training CDs for the finance professionals on topics related to accounting and taxation. These courses provide details on how to implement the best processes for accounting, taxation, metrics, audits etc. pertaining to regulations/compliance, best practices etc. The following training is a pack of most informative training CDs on topics related Finance Frauds. 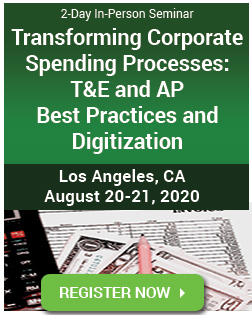 These courses provide details on detecting & preventing frauds in Accounts Payable, P2P, Employee Reimbursement & how to implement Whistleblower Program. Below Training CDs are top identified trainings on financial frauds, most important rules and regulations and how to stay compliant. Along with techniques to identify and how to deal with various frauds like Accounts Payable and Employee Reimbursement Fraud, you will also learn all about Standby Letters of Credit, OFAC, Anti Boycott and US PATRIOT Act. This seminar will provide you with the tools you need to establish and maintain strong internal controls that meet Sarbanes-Oxley standards by reducing risk and protecting company assets. This comprehensive training package of seven courses is aimed at helping firms gain a clear understanding of International Financial Reporting Standards (IFRS) reporting requirements and compliance. This banking webinar package covers current critical GRC topics in the banking sector, allowing participants to touch important areas in Governance, Risk and Compliance. 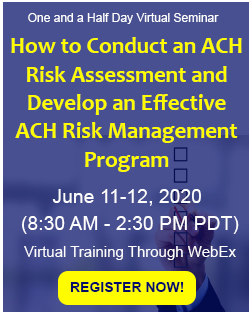 This three-part webinar series is designed specifically for businesses who either currently process ACH credits and/or debits, or those exploring the Network for use in the future. Each session builds off the last providing businesses with ACH essentials. This corporate governance training package addresses compliance strategies to deal with the US Foreign Corrupt Practices Act (FCPA), the UK Bribery Act and the SEC's new whistleblower rules. This comprehensive training package of five courses will help risk professionals and compliance officers understand the shifting paradigms of risk management, how to implement business continuity programs and the financial issues in emergency management. 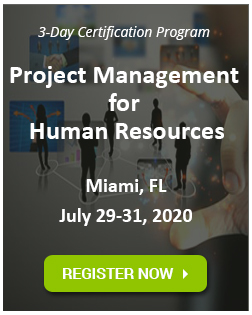 This comprehensive training package of eight courses will help HR professionals gain a better understanding of how to manage employees, conduct performance appraisals and motivate the workforce. This comprehensive Human Resources training is based on some most important responsibilities which includes auditing HR function, basic and meaning HR metrics, FMLA/ADA management and handling employee sensitive issue like dress code. The following training is a pack of most informative training CDs for the Human Resources practices. These courses provide details on how to implement the best processes for hiring, performance evaluation and termination pertaining to regulations/compliance, best practices etc. The following training is a pack of most informative training CDs on topics related CA State HR Rules & Regulation. These courses provide understanding on how California State HR Rules apply to organizations pursuant to information like workers compensation, Wage & Hour Compliance, PDL, FMLA, SDI, CFRA, ADA etc. Learn about most important HR Employees Issues and how to deal with them. The training CDs cover top aspects for an HR professional to understand Performance Evaluation, Workplace Misconduct, Employee vs Independent Contractors and also HR Skills for Project Management. This 3 part training series will analyze the three seemingly different bodies of law that often overlap leading to ambiguity and confusion. What are the eligibility/coverage criteria under the FMLA and the ADA/ADAAA and workers Employee Leave Abuse under FMLA, ADA and Workers' Comp and Crafting Policies and Procedures for Managing Employee Leave. 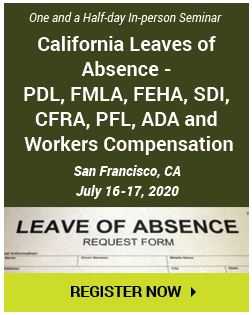 At the crux of the CFRA and FMLA is the notion that an employee is entitled to take a leave of absence for family care or for a serious health condition without the fear of losing his or her job. Parts I and II of this course will teach you how to successfully navigate the requirements set forth by the CFRA and FMLA. This comprehensive training package of 6 courses is aimed at helping pharma/drug companies to be compliant and streamline the supply chain planning, processes, risk management etc by maintaining regulatory guidelines. This comprehensive training package of 7 courses is aimed at helping companies to be compliant and streamline the robust supply chain planning, processes, risk management etc by maintaining regulatory guidelines. This training program in the exclusive 4-part series will examine in details the Mexico Import/Export Process, non-tariff barriers compliance, documentation compliance & customs administrative processes. It will also explain Mexican customs criteria on INCOTERMS & related groups & documentation to support the INCOTERM use. 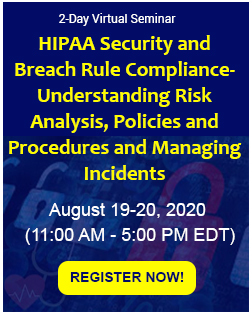 Attendees will also understand the concept of Harmonized System code - Its structure, origin, general rules, general notes, and explanatory notes at how it works at international level and at a national level. This comprehensive training package of six courses provides enterprises a clear understanding of workplace safety issues such as accident investigation, lockout/tagout, OSHA inspections, OSHA injury and illness recordkeeping, effective safety programs and hazard recognitions techniques. This 4 course OSHA training webinar will cover Compliance information (CA), Recordkeeping, Misconception and Hazard Communication. These training are chosen to provide you with the most important information on OSHA led by experienced Speakers. 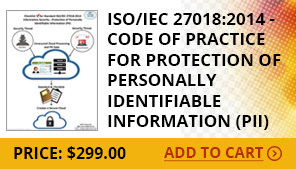 The following training is a pack of most informative training CDs for the OSHA documentation and recordkeeping. These courses provide details on how to implement the best techniques of OSHA recordkeeping and documentation pertaining to regulations/compliance, best practices etc. 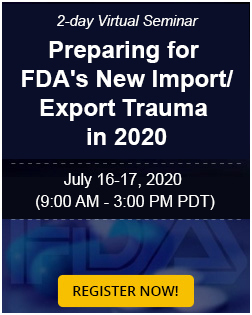 The current Federal OSHA administration is taking steps to require employers to create and enforce Injury and Illness Prevention Programs, what they refer to as I2P2. These training CDs will cover information on OSHA Recordkeeping Compliance and how to write a safety plan that complies with OSHA requirements.